Jamaal Charles’ 28-point performance on Monday night sealed victory for Team Aaron over a struggling Snowplow Sam squad. Aaron, who’s team won its third game in a row, also got a 27-point performance out of Matt Asiata. Asiata is playing largely due to the absence of Adrian Peterson who, coincidentally, was drafted first overall by Snowplow Sam. 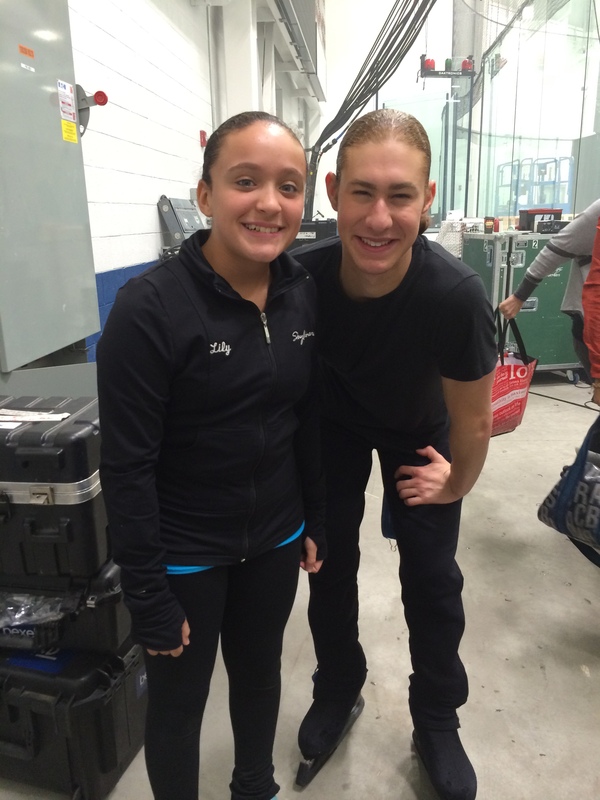 Team Aaron has not lost since his Aaron won the 2014 International Figure Skating Classic in Salt Lake City, Utah. Ross Miner’s ‘miner problem’ improved to 3-1 on the season and also handed John Coughlin’s squad its fourth straight loss. Miner got strong performances from DeMarco Murray (26 points), Randall Cobb (23 points) and Matt Ryan (19 points), while Coughlin had just one 19+ point performance (Alex Smith). Coughlin will need to start picking up some wins soon if he wants his team to make the postseason. While both teams had poor weeks, it was Ricky Dornbush’s Team That ‘D’ that came out on top over Charlie White’s squad. Dornbush’s squad had three double-digit performances while Team White had just two. White’s team also had five less-than-five point performances. Dornbush came from behind with a 19-point performance from Drew Brees on Sunday night to seal the win. Next week will be a critical week for both of these teams as the league starts to take shape. What a big week for Evan Bates… First, he takes silver at Nebelhorn Trophy with partner Madison Chock and then he gets his first fantasy football win of the season. Bates’ win was dominate, beating Ryan Bradley’s squad by nearly 30 points. Team Bates had six players score in double figures while Bradley had just three. The magical run of Ashley Wagner continued this week as she improved to 4-0 on the season with a 38-point win—the largest margin of victory this week—over Team Knierim. The first-time fantasy football player was led by Andrew Luck who scored 29 points. Steve Smith led three other double-digit performers for Wagner’s team. Knierim, who was the only other undefeated team entering the week, had just two 13+ point performances, but also had to count -8 points from the Carolina Panthers. SKATING magazine readers, you are in for a treat this week when you receive your October issue with the Olympic ice dance team of Maia Shibutani and Alex Shibutani on the cover. The Shibutanis are leaders when it comes to social media and they are helping SKATING magazine launch a new interactive experience that will bring the cover of each SKATING magazine to life. Watch the video below to learn more about this exciting addition to SKATING magazine. Enjoy! NOTE: Apple informed us this week that there are some bugs being worked out with its new IOS 8 upgrade. For those who have already upgraded to IOS 8, this will impact the Actable application until October 12. We are sorry for the inconvenience. For iOS 7 users and Android users, the experience is ready to go! 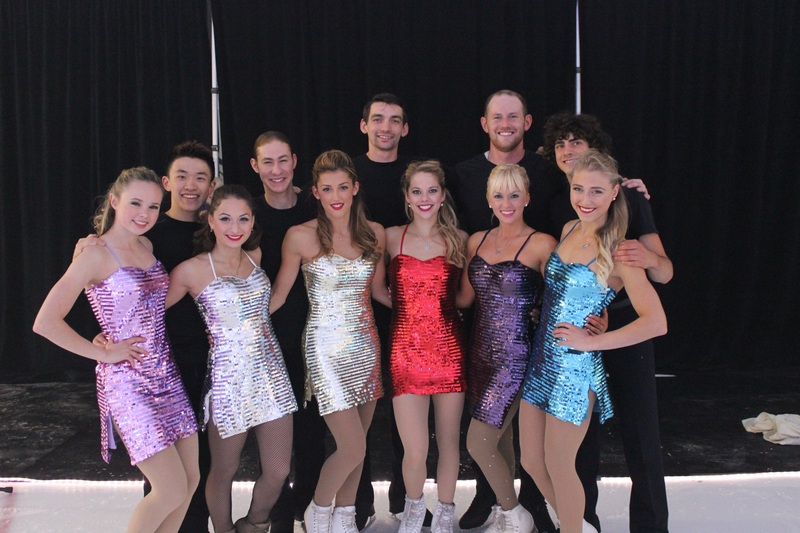 Members of Team USA past and present made the final appearances of the Lake Placid Saturday Night Ice Show season. 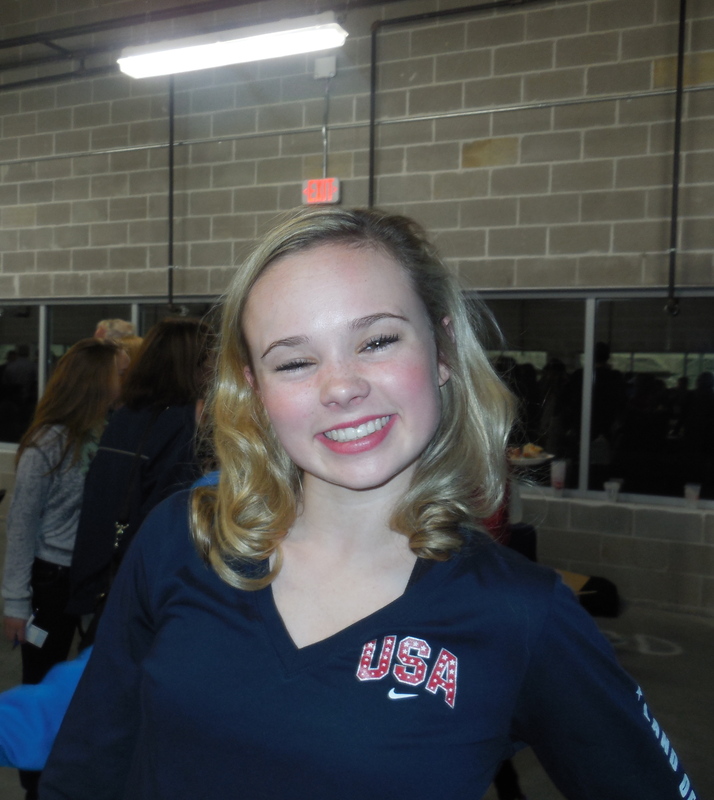 Madison Hubbell and Zach Donohue, Ashley Cain, Ryan Bradley and Kimmie Messiner performed in front of enthusiastic crowds from mid-July through late-August. Hubbell and Donohue, three-time U.S. medalists and World competitors, skated their show program to Sam Smith’s “Lay Me Down” and an energetic swing medley program that was a modified version of last season’s short dance. The team endured a difficult season last year due to Hubbell’s injury, a torn labrum in her left hip. This meant that they could not accept the available slot at the World Championships that was vacated by Olympic champions Meryl Davis and Charlie White. Still, they are determined to focus on the positives and this coming season. The show in Lake Placid marked the first time they had performed since winning the Four Continents Championships in January. 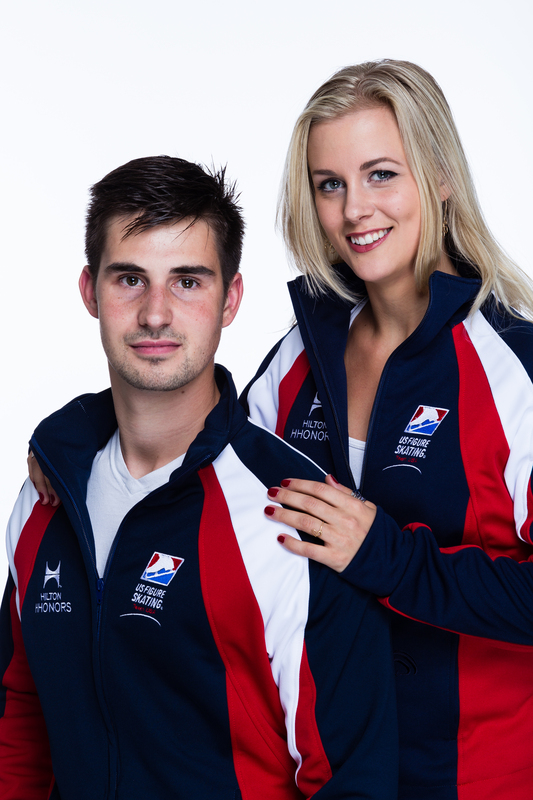 “We want to qualify for the Grand Prix Final,” Hubbell said. “And we want to place in the top two at the U.S. Championships,” Donohue added. Of course, the team also has its sights set on the 2018 Olympic Games. “We feel like if we put our work in and pay attention to staying healthy, we will be able to reach our goal of the Olympics,” Hubbell said. Cain entertained the audience by skating two programs — one to Beyonce’s “I Was Here” and the other to Michael Buble’s “Feelin’ Good” — with her characteristic elegance. After a productive 2013–14 season, Cain deserved a semi-vacation in Lake Placid. 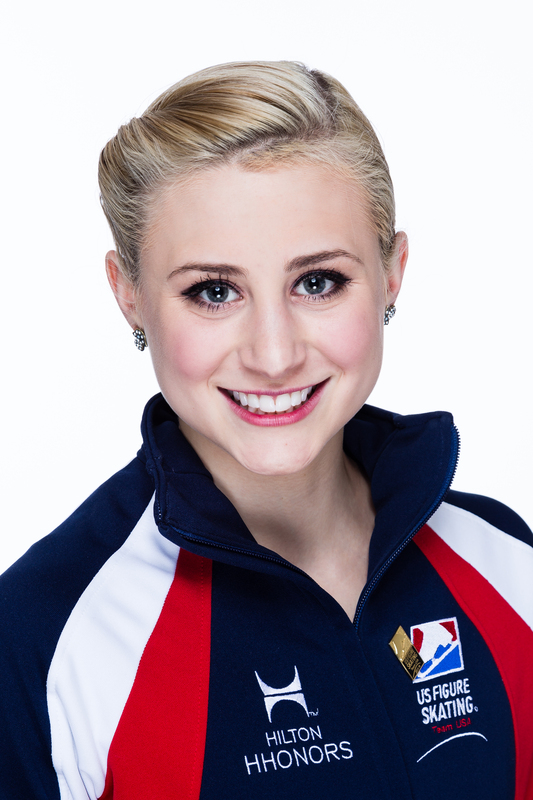 She placed third at the 2013 Nebelhorn Trophy, which allowed her to qualify for Grand Prix assignments this season. Cain was awarded two Grand Prix events for this fall: the Cup of China and the Rostelecom Cup in Russia. In addition to performing, Bradley offers private lessons and a seminar to skaters participating in the Lake Placid Summer Skating Camp. During the summer, Bradley is a resident show skater in Sun Valley, Idaho, a place he considers “the Lake Placid of the Rocky Mountains,” because of its similar legendary skating history and multiple ice surfaces. Bradley spends the rest of his time traveling for shows and other skating events. This year, he is also working with the Ice Theatre of New York. Meissner, the 2006 World champion and 2007 U.S. champion, starred in the final Lake Placid Saturday Night Ice Show of the season, skating to “Applause” by Lady Gaga and “Experience” by Ludovico Einaudi. Meissner is still busy these days skating in shows and coaching. Meissner started in school studying exercise science then switched to English. She has also been working on a writing career and worked as a figure skating researcher for NBC at the 2014 Olympics. Headliners included Olympic medalist Jason Brown, 2012 U.S. pairs champions Caydee Denney and John Coughlin, 2013 U.S. pairs silver medalists Alexa Scimeca and Chris Knierim, and New York-area standout Samantha Cesario, U.S. junior silver medalist Mariah Bell and U.S. junior bronze medalist Jimmy Ma. The show served as the official opening for Twin Rinks, a privately funded $15 million state-of the-art venue nestled in Eisenhower Park, located near Jones Beach, the famous New York State Park. The 165,000-square-foot facility consists of two indoor, NHL-sized skating rinks, as well as one outdoor rink. Senior and pre-juvenile teams from the Skyliners, a nationally ranked New York-area synchronized skating program, glided, turned and twizzled their way around the ice, along with a cast of more than 120 young up-and-comers who performed group numbers. The 18-year-old Bell, who trains in Monument, Colo., under coach Kori Ade, felt the crowd’s excitement. 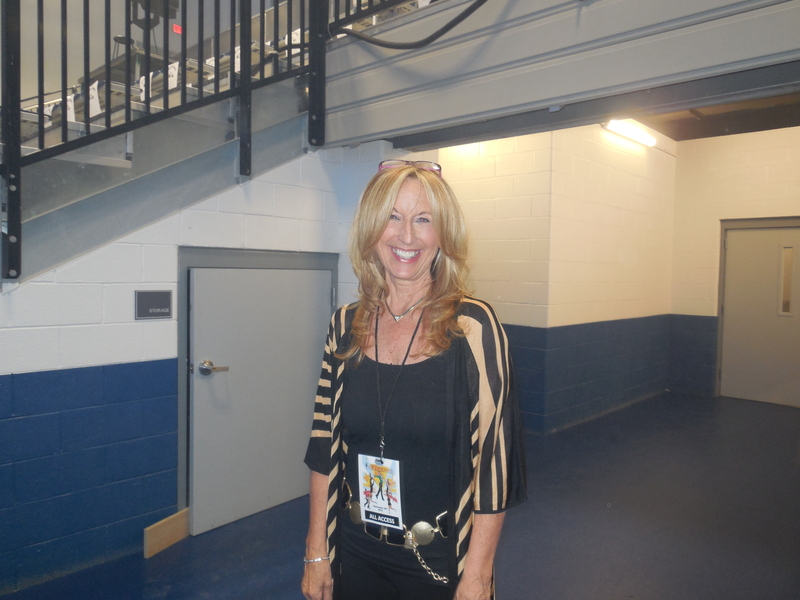 Show producer Tara Modlin was thrilled with the turnout as well as the energy that permeated in the building. The good feelings continued at the show’s after-party in an upstairs room at the venue, where skaters posed for photos, signed autographs and chatted with fans. Brown ignited the crowd with a lively rendition of Little Walter’s song “Juke,” the competitive short program he will use this season, as well as “Cotton-eyed Joe,” which he performed in the Smucker’s Stars on Ice tour this spring. In the latter, he wore overalls and a red and black plaid flannel shirt. He reeled off a soaring Russian split and lightning-quick triple flip, triple Lutz and two triple toes. “I’m always pushing myself to be the best I can be and I just want to inspire people with my performances,” the 19-year old from Highland Park, Ill., said. Brown put skating in the national spotlight last season with his electrifying Riverdance free skate at the U.S.
Championships in Boston. The performance helped earn him a U.S. Olympic Team berth. To date, this program has generated more than 4.8 million YouTube views, making it one of the most-watched figure skating programs ever on the Internet. “I love to perform and bring skating to people; that’s what drives me,” said Brown, who like Bell, trains under Ade in Monument. Brown’s presence was much of the reason for the huge crowd, according to the show’s organizers. Last summer, Gelderman, who with the late Peter Burrows, coached 1982 World champion Elaine Zayak, relocated to Twin Rinks with the goal of helping grow figure skating in the New York-metropolitan area. Vision, of course, is everything, particularly in a sport such as figure skating. Sarah Hughes, the 2002 Olympic champion who grew up and trained for many years on Long Island (with Patti Johnson D’Alonzo, a Twin Rinks staff member, who had taught her from Basic Skills through junior ladies) said in her opening speech that learn-to-skate programs and shows are what help spark the passion in athletes. “This is where it all begins,” Hughes told the crowd. Skyliners coach Josh Babb agreed. Other coaches here said shows like this have a profound effect upon people, particularly the younger generation. The third week of the inaugural U.S. Figure Skating Fantasy Football League is complete. Ashley Wagner and Chris Knierim sit atop the standings at 3-0. Evan Bates and John Coughlin are still looking for their first win. Ross Miner’s miner problem notched the league’s highest score of the week, beating Snowplow Sam, 121-50. In fact, Snowplow Sam would have been beaten by every other team in the league. Miner got off to a great start, benefiting from the Atlanta Falcons huge win on Thursday by way of Julio Jones’ 28 points. Another 24 points from Marshawn Lynch and double-digit performances from four others helped secure the win. For the second straight week, Max Aaron put his team in the win column (Since winning #SLC2014, he’s been on quite the streak!). Aaron’s heavy investment in the Philadelphia Eagles paid off after he got 26 points from quarterback Nick Foles and 21 points from wide receiver Jeremy Maclin. Bradley was hurt by just one point from Frank Gore and two points from the 49ers defense. The improbable streak continued this weekend with Ashley Wagner improving to 3-0 against fellow 2014 Olympic team member Charlie White. Wagner has yet to win a matchup by fewer than 22 points—a league best. 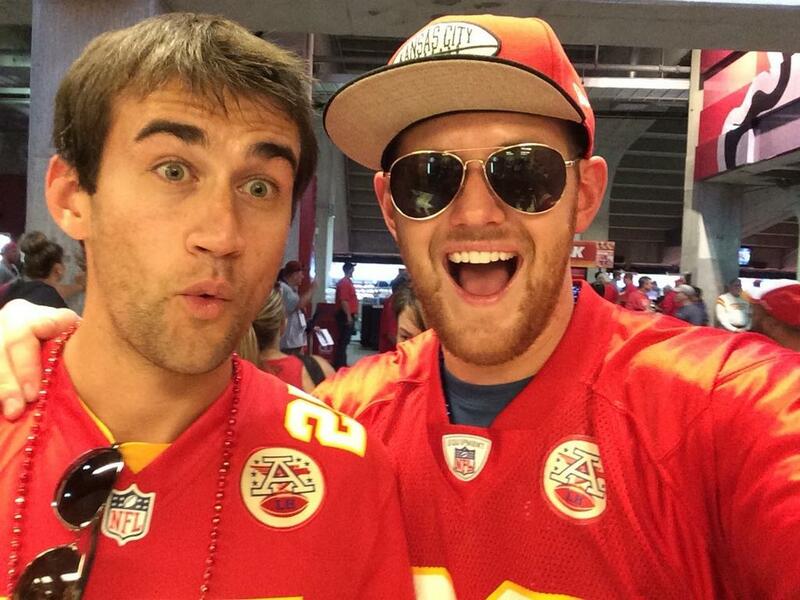 Wagner used Andrew Luck for 31 points, but was otherwise held to single digits. White’s highest (and only double-digit) scorer was his kicker, Nick Folk (15 points). Chris Knierim moved to 3-0 with a come from behind win over John Coughlin’s now 0-3 squad. Trailing entering Sunday night, Cutler used 16 points from Jay Cutler to get the four-point win. Coughlin was counting on Brandon Marshall to have a big night, but after being slowed by an injury early in the game, Marshall ended with zero points. Ricky Dornbush took the gold medal at the Lombardia Trophy and picked up his first fantasy football win of the season (Not bad, huh?). He was led by 19 points each from Drew Brees and Pierre Garcon. Bates, who was hampered by four five-point or fewer performances (Eddie Lacy, Joique Bell, Keenan Allen and Jimmy Graham) could have won if Alshon Jeffery had had a big game on Monday night, but came up 13 points short. Amy LaReau saw her first performance of The Phantom of the Opera in San Francisco in 1995. For this adult skater, who makes London her home, it marked the beginning of an almost 10-year love affair with the timeless musical. LaReau, who was skating at Sharks Ice at San Jose in Calif. at the time, was hooked. She loved the extraordinary special effects, from the chandelier bursting from the stage above the audience, to the New Year’s Eve party, to the final return to The Phantom’s lair. When LaReau’s husband Brian was transferred to London, LaReau settled into skating at Queens Ice and Bowl, just 20 minutes from her London home. She also began attending more performances of The Phantom and to this day has seen the production 18 times in just about every venue imaginable. 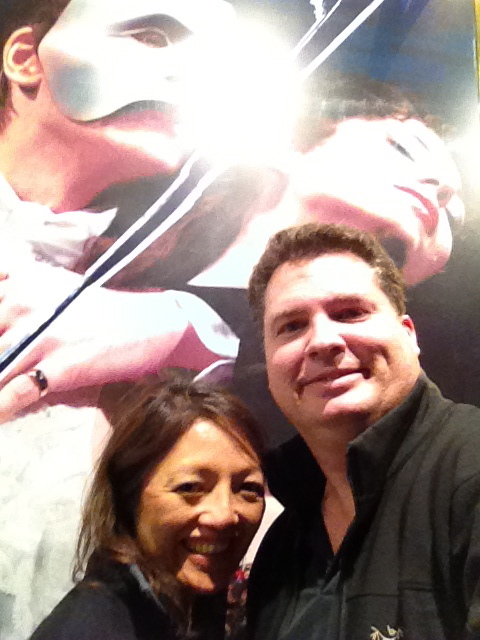 La Reau and her husband Brian stand in front of The Phantom at Her Majesty’s Theatre in London. Other memorable productions include attending her former high school’s version of the famed musical (Presentation High in San Jose) and two performances at The Venetian Hotel in Las Vegas. The LaReaus also saw the Broadway production. 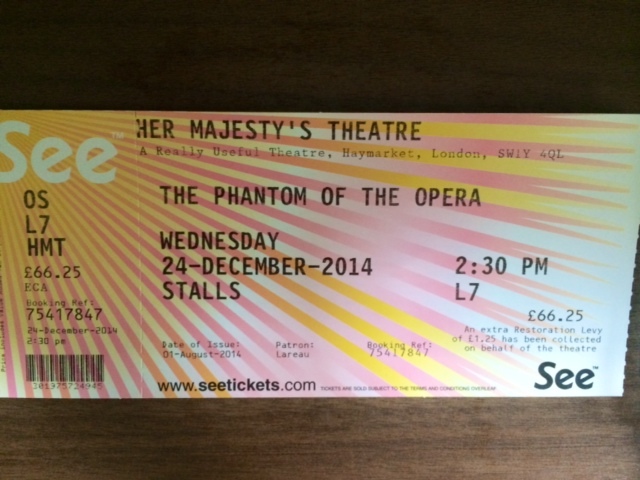 Since moving to London, the LaReaus have had the luxury of experiencing The Phantom at Her Majesty’s Theatre in the West End, where it permanently plays. 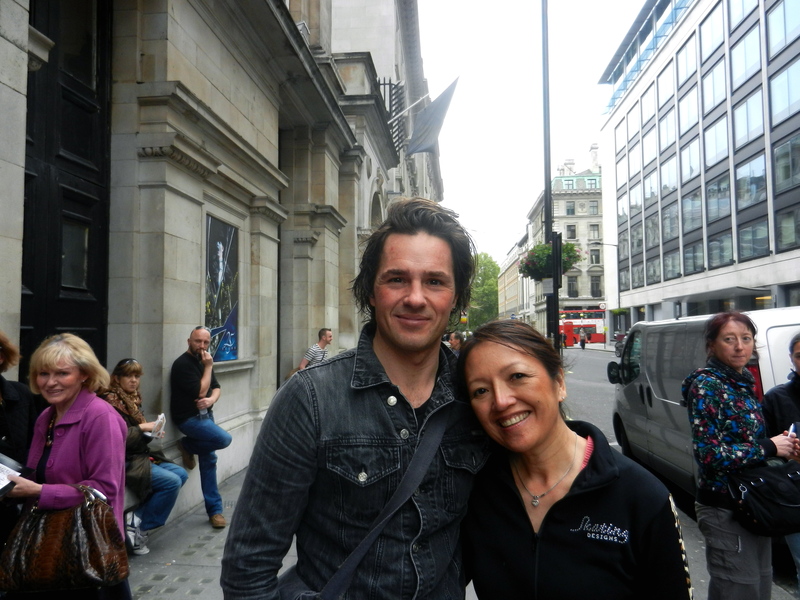 LaReau, wearing her skating jacket, meets up with Phantom Peter Joback in London. LaReau also met many of the actresses who have portrayed Christine. The LaReaus have even made The Phantom part of their annual holiday tradition. Although LaReau loves the music, she still has not included any of the soundtracks in a skating program. LaReau attends the Dorothy Hamill Figure Skating Fantasy Camp for adult skaters each year. She also has a secret dream of maybe one day taking part in an actual performance. “There is something magical about all the performances I’ve seen and I am always thinking about how fun it would be to be on stage as a cast member, even a small part,” LaReau said. In the meantime, she enjoys traveling with her husband and attending matinee performances if the show happens to be playing in their destination city. “Amy is a bit obsessed with it, but she always has a lot of fun and is thrilled with each performance,” added her husband Brian. LaReau already has ticket number 19 ready for December. Frank Carroll decided about six months ago that he wasn’t going to take on any more new skaters, but he has signed up for a new role that might have him working with more skaters than ever. U.S. Figure Skating recently announced that Carroll, who in his decades of coaching has guided the likes of Michelle Kwan and Evan Lysacek, will figure into a mentorship role with the organization. Carroll, 75, will continue to coach U.S. champion Gracie Gold, Olympic bronze medalist Denis Ten, of Kazakhstan, Japan’s Daisuke Murakami and Cheyenne Taylor, who placed seventh at the novice level at the 2014 U.S. Championships. Although details as to how Carroll’s role as a mentor remain to be ironed out, Carroll plans to free up his schedule so he can assist other skaters and coaches one day a week. On that day, his regular skaters will work with other coaches at the rink in stroking or drama classes. The key to making this mentorship program work, Carroll said, was that he will not take on new students so coaches do not have to worry that they will lose skaters. Carroll, who has been to every Olympic Winter Games since they were held in Sapporo, Japan, in 1972, will be 79 at the next Olympic Games in PyeongChang, South Korea, in 2018. He also has been coping with polymyalgia rheumatica, an inflammatory disorder that has resulted in extraordinary pain in his muscles. He has been so besieged by the ailment that he said he has lost 18 pounds. “I really don’t have any answer for what I’ll be doing for the next Olympics,” he said. One thing is certain, he will continue to be one of the hardest-working coaches around. Carroll, who only teaches while wearing skates, works every day, arriving at the rink at 8:15 a.m., and often he does not leave until 5 p.m. “And I bring my lunch bag with me,” he said. U.S. coaches at Champs Camp were excited about the opportunity to work with Carroll. Some of the coaches there were Carroll’s former pupils. Tom Zakrajsek, who coaches Max Aaron in Colorado Springs, said Carroll has been an informal mentor for years.